This Finnish band was active also as a live act in 2004-2008 but sadly folded after releasing only one full album. It would have been interesting to see where they would have gone with more time. 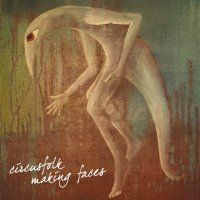 Making Faces is not only very promising debut, it's finely produced, exciting, original and mature prog rock album. Unfairly short one, but full of intelligence and emotion. Their prog aspect is more Eclectic than Symphonic, rather guitar oriented, and blessed with a suitable amount of pop catchiness - without having much of repetitive chorus-refrain-chorus structures! They don't have any distinctive Finnish sound, instead one could guess they're from England, USA or Sweden. The opener 'Submarina' is a dark ambient instrumental painting an underwater atmosphere. An echoed guitar and machine-like screeches make brief appearances amidst fascinating serenity somewhere between Brian Eno and New Age. However this is quite dissimilar from the rest of the album; I would have liked to hear more such spaceyness. 'If' features Gentle Giant reminding rhythmic angularity especially in the vocals. 'Step Away' feels like edgy indie rock and is my least fave track. 'The Fool' (6:22, the longest track actually) is a wonderful prog number, mostly in a spacey atmosphere but with plenty of variety in tempo and soundscapes, and yet remaining totally coherent. Mellotron sound is present too, though it may not be a real mellotron. Charlotta Falenius's viola is as its most effective on this one. The next song resembles slightly 80's King Crimson with its angry bass / guitar parts. The vocals are also very good; I'm thinking of them as a cross between Elvis Costello and... Adrian Belew, perhaps. 'Haven' has excellent vocal delivery and sonic freshness similar to Daniel Lanois / U2. Then comes an eclectic mixture of rock energy and ambient-flavoured sound tapestry. This music is indeed highly intelligent without being dry at all. The closing song 'Strangers' partly returns to the submarinal soundscapes of the opener. Recommended for Crossover Prog listeners, easily worth four stars.